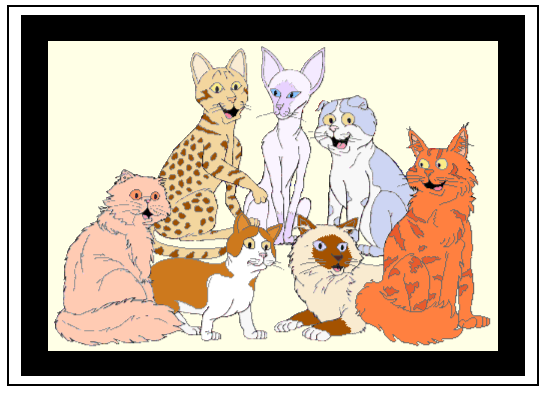 CATZ Inc was born out of a desire by a small group of cat breeders and fanciers wishing to create a centralised and service orientated New Zealand National Registry. This registry would be a part and parcel of the greater organisation, which would embrace a new inclusive philosophy on breeding and showing. From conceptualisation in January 2001, to the initial founders meeting and subsequent writing of a founding constitution in February, then to a second meeting and incorporation as a Society, was undertaken in only two months. The Society became a reality on March 5th, 2001. This marked the birth of a new Cat Fancy and Cat Registry in New Zealand. The primary policies, which would provide both the direction and framework upon which the Society would be built, expressed the perceived needs of a modern cat association. The founders asked of themselves – “What is it that we wish to preserve?” and “What will help to create an environment conducive to a personal pursuit for excellence, while enhancing friendships, stimulating innovation, as well as building and maintaining integrity?” The answer in part, was to formulate and adopt a set of foundation policies, which would give direction to, and be a driving force behind, every process within the new organisation. And as these policies were considered central to the principles behind foundation, they were written into the society’s Constitution, with the rider that they were non negotiable and could never to be changed. We believe that cat breeding and exhibiting is a recreational hobby to be enjoyed by individuals and families alike. We believe that breeders and exhibitors should be able to register and show their cats with any registry they choose, without fear of restriction, limitation or compromise. We believe that the imposition of restrictions or limitations is for self-serving interests, rather than for the genuine love of cats or the true spirit of sportmanship. 19.1 CATZ Inc. has been established by individuals wishing to preserve the freedom of individual cat fanciers, to self determine the shape and type of Cat Society best suited to achieve the objects which they hold in common, based upon the principle of ONE PERSON, ONE VOTE. 19.2 CATZ Inc. has been established by individual cat fanciers, wishing to preserve the basic principles of a genetic registry, while adopting a policy of inclusion, and not exclusion. 19.3 CATZ Inc. has been established by individuals who believe that their Society should be pro-active in presenting cats in a positive public image, in promoting the benefits of sharing life with companion cats, while preserving the rights of responsible breeders registered with the Society. 19.4 CATZ Inc. has been established by individual cat fanciers, who believe in the principle that all cats are created equal and are therefore entitled to fair and equitable treatment by individuals, the Society, companies and local and central government. 19.5 CATZ Inc. has been established by breeders who believe in the principle that the CATZ. Inc. Standards of Excellence for breeds, should not be altered without due process of consultation with ALL breeders who elect to join a Breed Council established for this purpose. 19.6 CATZ Inc. has been established by individual cat fanciers who believe that the Administration, Selection and Licensing of Judges should be managed by an Independent Guild of Peers, within the framework of the Society. 19.7 Policies may be added to those herein, or the wording of these policies may be amended at the discretion of CATZ in General Meeting, BUT the basic tenor or intent of these six original policies shall be deemed to be PERMANENT and may NOT be repealed.